Discover the importance of finding an LMS that delivers a superior customer experience for your organization. Ease of use and scalability are essential but finding an LMS that offers the ideal customer experience should be #1 on your list. Find 6 key questions to ask in order to gauge your LMS expectations before purchasing an LMS. Check if you can count on the LMS vendor to help you optimize functionality and get the most from your new LMS. Learn how to evaluate LMS vendors when purchasing a new Learning Management System. Discover tell-tale signs that your current platform scores low in LMS customer experience. Learn how to avoid 7 LMS customer experience challenges. 7 common elements to observe. Get invaluable hints and tips from customers that have evaluated the LMS before you. An exploration on how CX applies at every stage of the LMS buyer’s journey. Learn how to use an online directory to find an LMS that offers the best CX. Discover 5 ways to evaluate the LMS customer experience during your next free trial or demo. 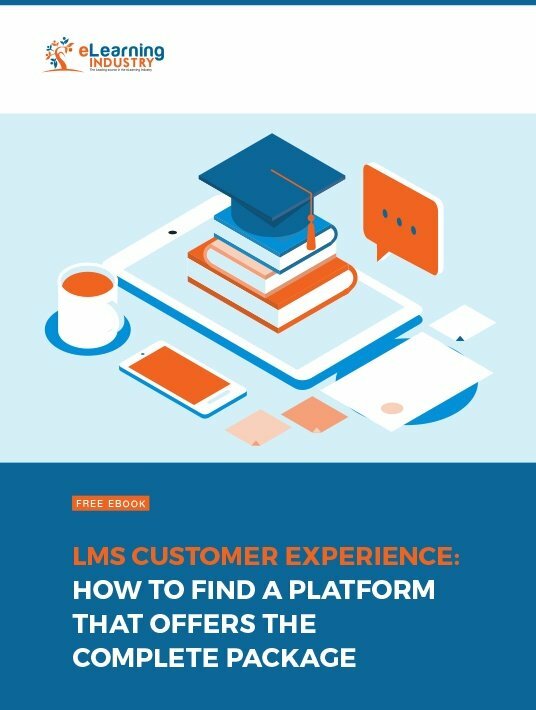 This free eBook summarizes all you need to know so you can find the platform that offers the best LMS Customer Experience. Find out why LMS Customer Experience really matters, the benefits of delivering a Superior CX for your organization, and how to set your LMS expectations before purchasing a new platform. Discover the traits all customer-friendly LMS solutions have in common and learn how to use LMS reviews and rating to evaluate your next LMS, and how to use an online directory to find and evaluate LMS Vendors that offer the ideal level of LMS Customer support. Check how to identify signs that your LMS Vendor really values LMS CX, as well as challenges to avoid in the selection process, understanding the LMS Buyer’s Journey in every stage of the cycle. Last, find tips on how to evaluate LMS Customer Experience during a Free Trial or Demo. One of the most common mistakes that organizations make when choosing an LMS is setting the bar too high. Especially those that are making the switch from traditional training and aren’t familiar with LMS features and specs. A great way to set realistic LMS expectations is to schedule a meeting with your top choices to see how they can help you bridge training gaps.